South Webster’s Maddie Cook battles with Piketon’s Ally Ritchie for a rebound during the second half of Monday’s Division III sectional semifinal at Valley High School. South Webster freshman Faith Maloney scores during the first half of Monday’s 44-38 win over Piketon in a Division III sectional semifinal at Valley High School. South Webster’s Bri Claxon scored a game-high 14 points in Monday’s 44-38 win over Piketon at Valley High School in a Division III sectional semifinal. LUCASVILLE — South Webster’s Bri Claxon is a freshman … but Bri Claxon doesn’t play like a freshman. 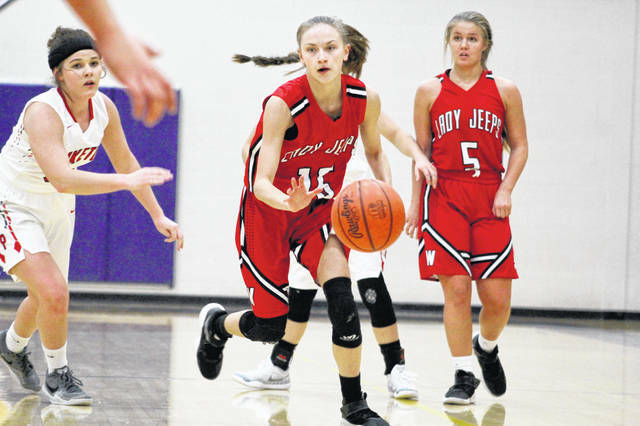 With her team trailing 19-17 at halftime, and with its season on the line, Claxon stepped up in a big way Monday night and sparked a second half run that led to a 44-38 win over Piketon in a Division III sectional semifinal at Valley High School. 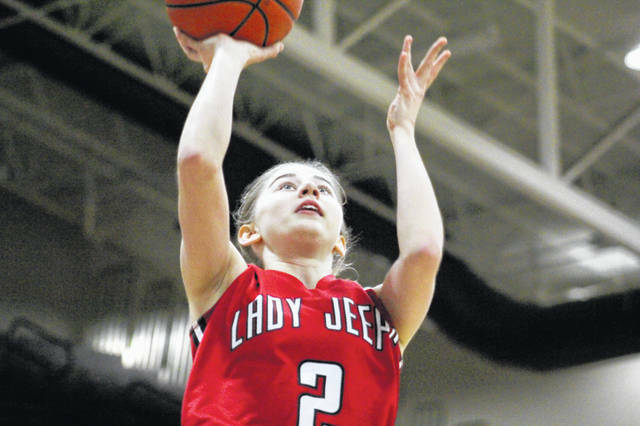 Of her game-high 14 points, Claxon scored 11 in the third quarter alone … a period where the Jeeps (9-13) outscored the Redstreaks 15-9 and took control of the ballgame. The Jeeps are also fortunate to have Maddie Cook and Baylee Cox, who combined to score 16 points and grab 21 rebounds. 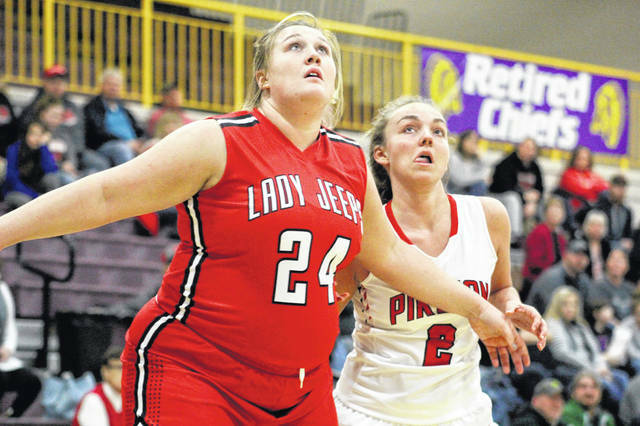 As a team, Piketon brought down 24 rebounds. The Redstreaks came out of the gate firing. Behind a 3 from Ally Ritchie and two putbacks from Brianna Odel, Piketon grabbed a 9-2 lead with 3:58 left in the first quarter. But at that moment, South Webster called upon Cook and Cox to enter the game, shifting momentum. That duo kept the Jeeps in the ballgame, cutting the lead to just two at halftime, 19-17. That decision gave Claxon the chance to shine. Trailing 21-17 with 7:10 to go in the third, Claxon tied the score with back-to-back buckets before Cook gave the Jeeps their first lead of the night at 23-21 at the 5:37 mark. Then, with the game tied at 24, Claxon led an 8-0 run as South Webster take full control, 32-24. Lightle then hit two free throws and Odel scored again, cutting the lead to 32-28 heading to the fourth. With 4:34 left in regulation, Lightle dialed long distance to cut the lead to 36-34 … but that was as close as the Redstreaks came to regaining an edge. Down the stretch, the Jeeps remained relentless on the glass and hit needed shots to put the win on ice. Claxon led South Webster with 14 points while Cook added 10 points and a game-high 11 rebounds. Cox finished with eight points and 10 rebounds, and Karli Montgomery ended the night with two points and five rebounds. For Piketon, Lightle had 14 points and four boards, Odel added 11 points and a team-high six rebounds, and Ritchie ended with five points and four boards. While Piketon ends its season at 12-11 overall, South Webster advances to take on top-seeded Eastern Brown in a Division III sectional final at 1 p.m., Saturday at Valley. South Webster: 17-41 FG, 9-13 FT, 1-9 3pt. (Claxon 1), 43 rebounds (Cook 11), 26 turnovers, 7 assists (Hornikel 3). Scoring: Claxon 14, Cook 10, Cox 8, Maloney 4, Ka. Montgomery 2, Hornikel 2, Stephens 2, Ke. Montgomery 2. Piketon: 12-53 FG, 10-18 FT, 4-18 3pt. (Lightle 1, Odel 1, Ritchie 1, Little 1), 23 rebounds (Odel 6), 10 turnovers, 6 assists (Odel 2, Wagner 2). Scoring: Lightle 14, Odel 11, Ritchie 5, Little 4, Crothers 2, Wagner 2.
https://www.portsmouth-dailytimes.com/wp-content/uploads/sites/28/2019/02/web1_Cook-1.jpgSouth Webster’s Maddie Cook battles with Piketon’s Ally Ritchie for a rebound during the second half of Monday’s Division III sectional semifinal at Valley High School. https://www.portsmouth-dailytimes.com/wp-content/uploads/sites/28/2019/02/web1_Maloney-1.jpgSouth Webster freshman Faith Maloney scores during the first half of Monday’s 44-38 win over Piketon in a Division III sectional semifinal at Valley High School. https://www.portsmouth-dailytimes.com/wp-content/uploads/sites/28/2019/02/web1_Claxon-1.jpgSouth Webster’s Bri Claxon scored a game-high 14 points in Monday’s 44-38 win over Piketon at Valley High School in a Division III sectional semifinal.